Some people are naturally born as wildcards- people who are hard to predict and even sometimes to understand. These people don’t usually like to play by the rules and tend to dance to the beat of their own drum. 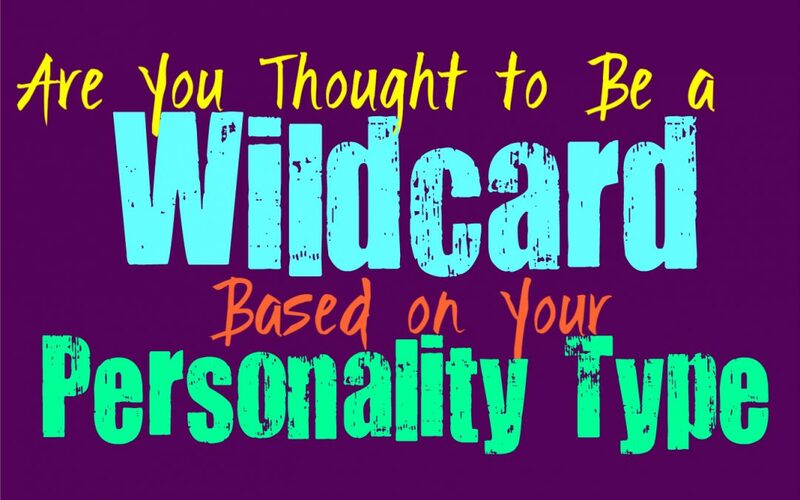 Here is how much of a wildcard you are, based on your personality type. INFJs aren’t necessarily wildcards, but sometimes they are perceived this way by people who don’t understand them. The fact that INFJs seem to find themselves with contradicting emotions and qualities, is something that causes people to view them as wildcards. This is because those people don’t quite understand how complex the INFJ is, and how much they going on inside of their heads and hearts. INFJs do follow their own patterns, and aren’t likely to do something that is all that out of the ordinary to themselves. It just becomes hard for others to decipher their actions because the INFJ can keep things to themselves often. ENFJs can be hard for people to really understand, and so they can be seen as wildcards sometimes. While ENFJs are sturdy and supportive people, there are moments when they seem to contradict themselves. This contradictory behavior makes them hard to really predict or even understand. On top of this, ENFJs do sometimes have a wild-side which comes out during times of stress, making them even more unpredictable. While they are normally responsible and helpful people, they can have these moments of being a bit over the top and even a bit wild. INFPs might be hard for people to really understand, especially when they don’t know them all that well. INFPs can be seen as wildcards, simply because their behaviors aren’t completely predictable. Sometimes they just enjoy experiencing something differently, instead of the same thing on a daily and constant basis. INFPs have rich and creative inner minds and this can cause them to become distracted and bored rather easily. When the INFP feels overwhelmed with boredom they might do things that are completely unpredictable, earning them the title of wildcard. ENFPs are definitely wildcards, especially for people who aren’t extremely close to them. They can be somewhat unpredictable people, even if this is just in smaller ways. They don’t like following the rules or doing the same things over and over again. This desire to experience change and dive into new things, definitely causes the ENFP to seem like a bit of a wildcard. They often enjoy being seen this way and don’t much appreciate people considering them boring or predictable. While ENFPs want their loved ones to understand them on a deeper level, that doesn’t mean they don’t like shaking things when they can. INTJs really aren’t seen as wildcards most of the time, since they have a sense of structure in most things they do. While they aren’t necessarily easy to understand, that doesn’t mean they are unpredictable or wild people. INTJs don’t mind following rules, especially ones they respect and believe serve a purpose. They are focused on following the facts and learning to understand as much as they can about the world. For the INTJ knowledge is the most valuable thing, and so this is something that makes them lack that unpredictable, wildcard personality. ENTJs really aren’t wildcards because they have a sense of structure and focus to their personalities. They believe in being efficient with everything they do, and don’t like making mistakes which could cost them failure. For the ENTJ their desire to achieve their goals and perfect their skills, it something which prevents them from being seen as wildcards. While they can have unpredictable aspects to their personality, this does not make them a wildcard. Instead they are often responsible and logical people, who have a strong work ethic. INTPs can sometimes be seen as wildcards, since they are difficult for most to understand or predict. INTPs find themselves changing their minds last minute, simply because a new piece of information takes them in a different direction. They want to really analyze all the different angles and this causes them to be difficult for others to really predict. They behave in ways that aren’t always easy to follow to comprehend, and sometimes they simply want to experience something new. INTPs are the types of people who will go off on a random road trip without telling anyone, and this is where their wildcard traits come to play. ENTPs can definitely be seen as wildcards, mostly because they are unpredictable people who don’t like following the rules. In some situations the ENTP will pretend to hold a certain belief, simply to play devil’s advocate or gauge the responses of those around them. In other situations they will strongly debate their sincere beliefs, so that they can prove themselves to be spreading the truth. These opposing behaviors definitely lend to giving the ENTP the title of wildcard, and it is well deserved and fitting of their personality. ISTJs are rarely, if ever, seen as wildcards since this just does not fit their natural personalities. Most ISTJs are the opposite of a wildcard, instead they are reliable and sturdy people. They often enjoy structure and schedules in their lives, since it helps them chase after their dreams and achieve their goals. They want to be able to be seen as accomplished and efficient people, and this takes a lot of work on their part. While ISTJs definitely have passionate and sometimes surprising aspects to their personalities, they are really not wildcards. ESTJs aren’t often considered to be wildcards, simply because they prefer to focus more on logical and efficiency. The ESTJs desire to get things done with a high level of skill and even perfection, causes them to be easier to predict in some ways. They strive for a sense of reliability and often appreciate what a good schedule can do for them. Being a wildcard often seems like an excuse to be reckless and irresponsible and this really isn’t something the ESTJ is going to find intriguing or worthwhile. ISFJs are often practical and sometimes predictable people, which is why they aren’t seen as wildcards. This isn’t something that upset the ISFJ, since they enjoy being someone that others can depend on. They often see people who are unpredictable as being a bit selfish, since they aren’t really considering how their behaviors will affect those around them. ISFJs care about being able to provide for others, especially their loved ones. They don’t want to be someone who is hard to understand, instead they want to be seen for their efforts and compassion. ESFJs are often seen as dependable and predictable people, but they are capable of being wildcards in some situations. There are times when the ESFJ who is often predictable on the surface, has a lot of complex thoughts and feelings which cause them to flip their behaviors in unexpected ways. This can be unsettling for people who view them as easy to understand, and so this can cause a bit of confusing. For the most part ESFJ do prefer to be dependable people and taking care of their loved ones is more important than anything to them. Since ISTPs are often independent and mysterious people, this definitely makes them into wildcards. It can be hard to predict their actions, since they keep so much to themselves that others cannot see. ISTPs enjoy diving into new experiences and sometimes just want to shake things up for the fun of it. Their sometimes reckless, chaotic and mysterious behaviors, makes them appear like serious wildcards to those around them. While ISTPs do have very logical minds, they still enjoy stepping out of their comfort zones as much as they can. ESTPs can definitely be wildcards, and so their actions and choices are difficult to always predict. While the ESTPs might often behave in one way, they can flip and change their minds last minute. ESTPs sometimes have reckless personalities simply because they don’t like being bored or stagnant. When a certain mood strikes them they can go completely against what they have previously suggested or said they enjoyed. ESTPs are unpredictable people with sometimes reckless and exciting personalities, which certainly makes them out to be wildcards. ISFPs really can be wildcards, but most people might not recognize this about them. They are free-spirits who don’t believe in following strict rules, instead they follow their hearts. The fact that ISFPs base most of their choices on their inner morals and emotions, this causes them to be unpredictable and often change their minds last minute. These traits certainly cause the ISFP to be a major wildcard, even for the people who know and care for them. ESFPs are definitely viewed as wildcards by most people who know and even love them. They don’t like behaving in a predictable way and can often change their minds last minute. It is hard to really know which direction the ESFP will go, or how they feel about something. While ESFPs are fun-loving people they can also have moments of truly wise insight. The fact that they go back and forth in this way makes it truly difficult to understand their choices, making them complete wildcards.